While birding out at the coast of Queens this year I have noticed on several occasions a variety of birds, mostly finches, feeding on the seeds of Seaside Goldenrod (Solidago sempervirens), the salt-tolerant, butterfly-sustaining, and absolutely gorgeous coastal aster. Though the flowers are long gone, along with the trademark, bright yellow coloration, they still sustain life through the many seeds still attached to the plant. 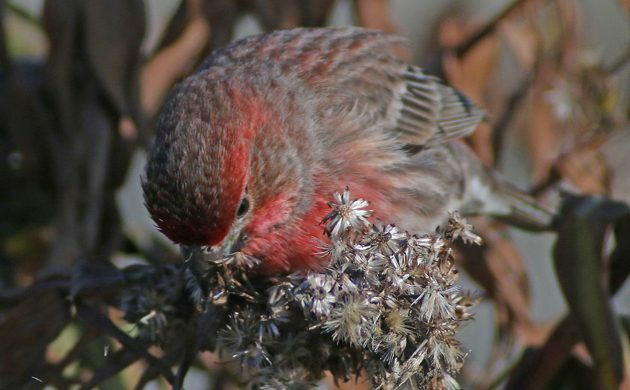 Sure, it is not as striking a situation as when Golden-crowned Kinglets are feeding in bright yellow flowers but House Finches plucking seeds can be plenty photogenic themselves. 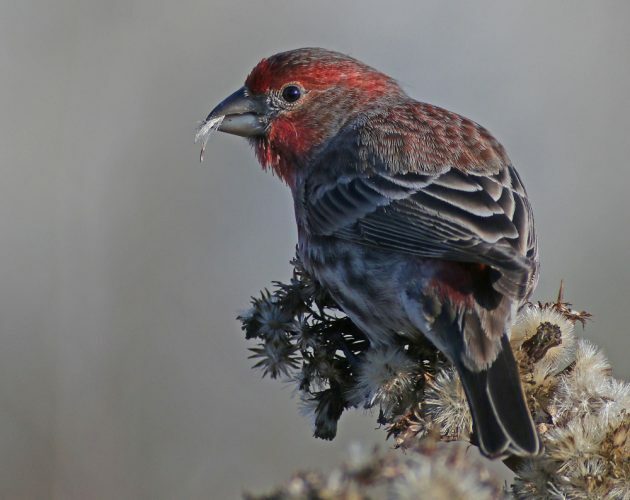 The finches were pulling the seeds by the fluffy end, which is used by the seeds to catch the wind for dispersal (like dandelions do), but then the finches had to manipulate them to get the seeds into their mouths. It seemed like a lot of work and I am pretty sure that they consumed quite a bit of fluff as well. And while I have no proof of it, I am relatively certain that they are getting a variety of invertebrate life hidden away in the goldenrod as well, much like dabbling ducks consume a lot more than just duck weed when they are feeding in a pond. I was pulled over on the side of the road that traverses the scrubby vacant lots in the eastern Rockaways when I took these pictures, shooting comfortably from my driver’s seat with the digiscoping rig balanced on my car window. The finches had no fear of me whatsoever though they did occasionally give me some side eye like the female finch above is doing. I sat and shot at leisure, occasionally switching the bird I was focusing on, hoping that one of them would be a Purple Finch but without any luck. 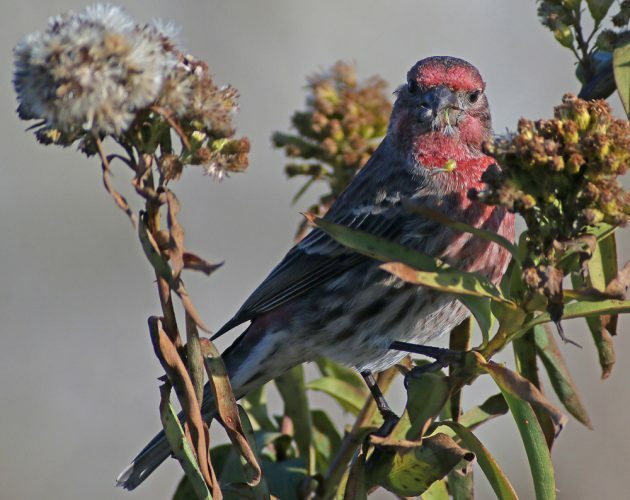 It seems like almost all of the Purple Finch that irrupted south this fall have passed through. I do hope we find some for our Christmas Bird Counts though! 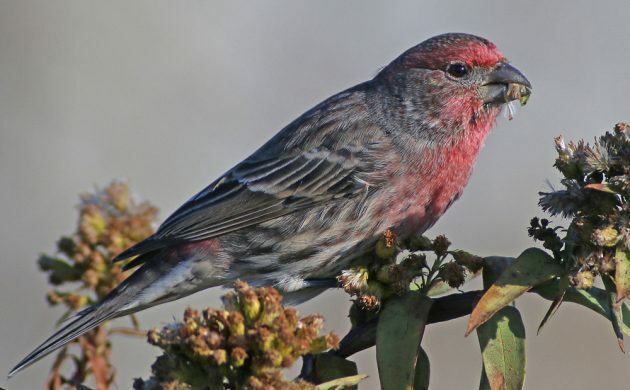 House Finch are alright themselves, though it still blows my mind that they are not native here in the eastern United States. 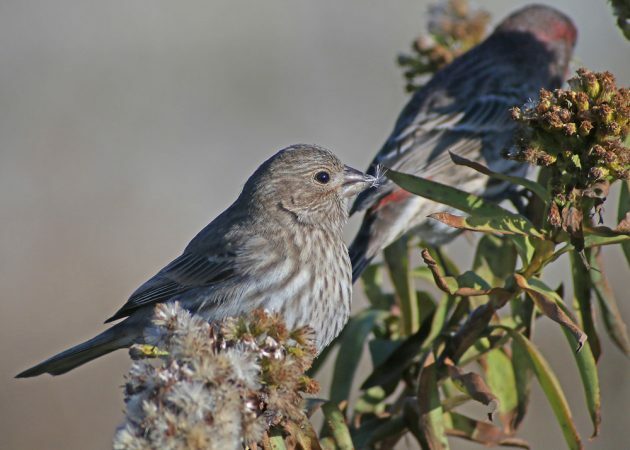 That such a huge population can have grown from released cage birds is astounding and shows how little we know about released and invasive species. What will and what won’t make it? 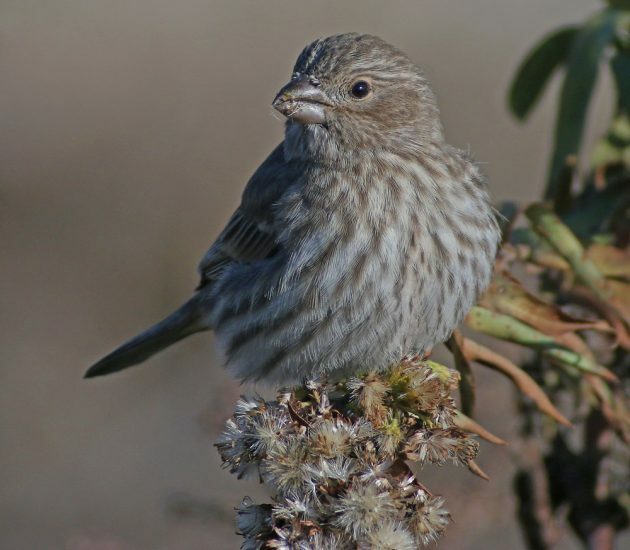 Does anyone have any idea how many House Finches were released and exactly when? Beautiful birds enjoying those tiny seeds. Great story behind those photos, Corey.